Classical Shakuhachi Honkyoku. 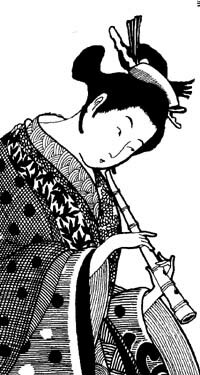 Honkyoku translates as"original music" for shakuhachi and is based upon "sui zen" or blowing zen used by early practitioners as a form of meditation. Sankyoku. A more modern for of ensemble music of shakuhachi with koto (a 13-string harp) and shamisen (a 3-string lute). Gaikyoku. New music for the shakuhachi. Contemporary World Music. Jazz, improvisation and other forms of modern music incorporating shakuhachi and traditional themes. Alphabetical Listings of All Shakuhachi & World Music Recordings. Includes links to artists and complete information for each recording.